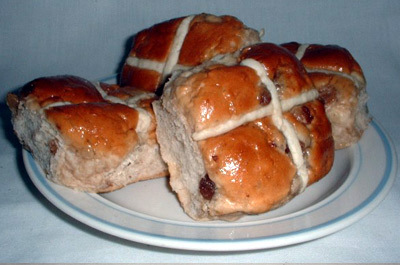 In many historically Christian countries, the buns are traditionally eaten on Good Friday, with the cross standing as a symbol of the crucifixion. Their ingredients mean that people who are observing lent are able to eat them as they traditionally contain no eggs or dairy products. They are believed by some to pre-date Christianity, though there is no original evidence for a pagan origin, and the first recorded use of the name Hot Cross Bun is not until 1733. According to food historian Elizabeth David, the buns were seen by Protestant English monarchs as a dangerous hold over of Catholic belief in England, being baked from the consecrated dough used in making the communion wafer. Protestant England attempted to ban the sale of the buns by bakers but they were too popular, and instead Elizabeth I passed a law permitting bakeries to sell them, but only at Easter and Christmas. Check out the recipe for the hot cross bun here. This entry was posted on Tuesday, April 10th, 2007 at 12:44 pm	and is filed under Easter Eggs, Interesting Stuff. You can leave a response, or trackback from your own site.